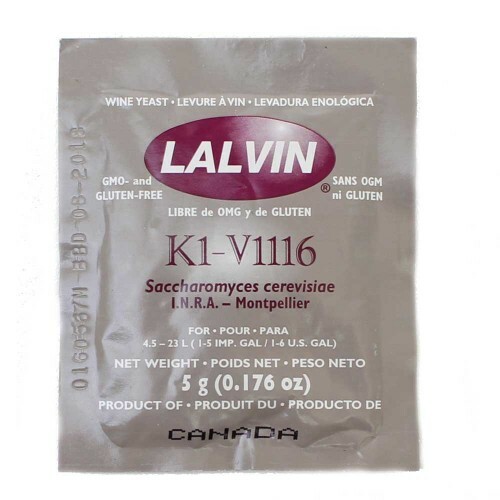 K1V-1116 Lalvin Wine Yeast - Texas Brewing Inc. Selected by the Institut coopératif du vin in Montpellier among numerous killer strains isolated and studied by Pierre Barre at INRA, the K1V-1116 strain was the first competitive factor yeast to go into commercial production and has become one of the most widely used active dried wine yeasts in the world. The K1V-1116 strain is a rapid starter with a constant and complete fermentation between 10° and 35°C (50° and 95°F), capable of surviving a number of difficult conditions, such as low nutrient musts and high levels of sulfur dioxide (SO2) or sugar. Wines fermented with the K1V-1116 have very low volatile acidity, hydrogen sulfide (H2S) and foam production. The K1V-1116 strain tends to express the freshness of white grape varieties such as Sauvignon Blanc, Chenin Blanc and Seyval. The natural fresh fruit aromas are retained longer than with other standard yeast strains. Fruit wines and wines made from concentrates poor in nutrient balance benefit from the capacity of K1V-1116 to adapt to difficult fermentation conditions. Restarts stuck fermentations. Highly recommended for dry whites, aged reds, and late harvest wines.